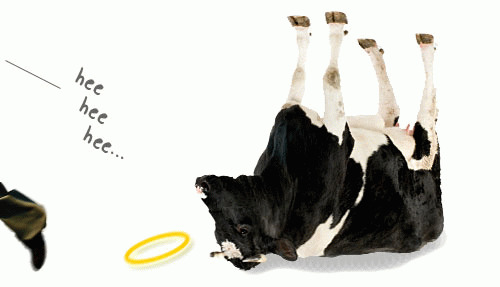 Sacred Pentecostal Cow Tipping - Come Lord Jesus? Are You Sure About That? There inevitably comes that moment in most Pentecostal church services where someone says "Come Lord Jesus" and the congregation erupts in approval. People start reiterating this mantra over and over as the crowd is almost in a frenzy at the notion that the day of the Lord might come swiftly upon us. With the explosion of social media, this clarion call for the end has only intensified and been associated with increasingly trite events. I actually saw someone today suggest the day of the Lord should hasten because one the most heralded actresses of our time used her public platform to suggest that people in power should not mock people with disabilities. Seriously. The world should end because someone expressed an opinion contrary to their political beliefs. The undeniable arrogance is staggering. But that is really the root of the problem is it not beloved. Christianity has grown to be a dominantly aggressive and arrogant religion in this country. It is why most people want nothing to do with it anymore. It is the risk of embracing absolute truth while ignoring all of the commands for humility. The Bible says that we should not take the best seat at the banquet but all you will hear preached is how we are the head and not the tail. The Bible says that the last shall be first yet we will only hear about how we were destined to reign. That disconnect is rapidly growing in the church. Come Lord Jesus? Are you sure about that? Let us reason together and examine three reasons why we may want to rethink our zeal for the end of the world as we know it. This is just to name a few. Of course these have been removed from pulpits across this country in favor of the purpose driven paradigm that seeks to never offend anyone. The result however is a puppies and rainbows gospel that cannot actually save anyone. This isn't a game beloved. This is what we believe as Christians. There is a heaven to gain and a hell to be very afraid of. When you remove the reality of hell what are you left with? This is why so many fall into the false teaching of universalism. Where everyone goes to heaven. This is what will lead to the one world religion that is spoken about in Revelation. But what does Jesus say about Himself? When Roma Downey put together the Bible Miniseries Christians went gaga over it. Who cares that they started with the story at Noah to avoid dealing with the literal creation story? The moment that stood out for me however, is when the Vidal Sassoon Jesus said that he was the way, the truth and the life and then there was a break to commercial thus avoiding the second half of the verse that confirms none come to the Father except through Him. None! That is the primary reason the world will hate us. Because they want to believe there is no consequence for their sin and Jesus comes along and says, not so fast. We used to support these notions which caused many in the world to dislike Christians. Today however, Christian leaders go on secular television programs and downplay sin and repentance. They create this illusion of universalism and then when they hold court on Sundays someone says come Lord Jesus and everyone applauds in agreement. What about those you claim to love? The second reason is similar and that is -- what about the rest of the world? How have we become so calloused to the lost in this world and within the church walls? So often when defending their favorite false teacher Christians will condemn their victims by saying they should have known better. What if people were praying for Jesus to come back before you were saved? We are supposed to be salt and light to a dying world so that some might be saved. What do we see instead in modern American Christianity? The New Apostolic Reformation and their Seven Mountains Mandate nonsense. This cancer is growing and spreading throughout the body of Christ and says that Christians need to facilitate the second coming of Jesus Christ by taking dominion over the seven mountains of culture, such as government and media. If not the NAR, we see the proliferation goat focused churches, offering fast food conversions, three sentence sinner's prayers and assurances of salvation that are simply false. The purpose driven church model shifts the focus of the church onto entertaining the unsaved instead of feeding the sheep. The result is less disciples, who make other disciples. The results are churches geared towards the unsaved that never explain to them how to get saved. In the Purpose Driven Life, Rick Warren offers a nine word sinner's prayer. Nine words to sum up salvation. After which, he declares to those who said the nine words; "welcome to the family of God!" Beloved it simply does not work like this. Beloved we must understand that when we cry out for the day of the Lord we are essentially praying for fire to reign down upon those who have not received Christ. Think about the arrogance of such a desire. That we have been so blessed as to have been saved by the immeasurable grace of God and yet we would want to deny that to someone else. Someone who is blind and walking in the same darkness that we once walked in. This is also a byproduct of the false Christian teaching that makes salvation a work of the flesh. Salvation is entirely a work of the Lord. He is the one who draws us. Yes, we play a small role in repentance and answering the call but it still belongs to Him. It is His gift. The Friend of God theologies teach about this wallflower Jesus just begging you to ask Him to dance at the eighth grade prom. There is no asking to be in relationship with Christ. Everyone on earth is already in relationship with Him. The only question is what the status of that relationship is. He is either your Lord and Savior or He will be your judge and jury. Jesus Christ is not your wingman and I assure you if He is not your Lord then He is not your friend. The bottom line for us as a church is to not fall into the trap of arrogance. Absolute truth belongs to God and His Word. Salvation belongs to Christ and His finished work on the cross. Instead of Lord Jesus come soon, our cry ought to be, Lord Jesus save but one more from the snare of the devil and prospect of eternal suffering apart from you! The final reason why we ought to be careful for what we think we want is that we just might get it. How is your own salvation doing today? Do you know the Bible says to work it out daily with fear and trembling? I do not see any true fear of the Lord anymore in the church and certainly no trembling. Once again, the church is a victim of its own teachings. What if I were to tell you that for the first 1800 years of the church, there was no theory of a pre-tribulation rapture? For the unware, this is the theory that the church will be whisked away into the clouds before all of the really bad stuff starts happening here on earth in the end times. Well, wouldn't such teaching lend itself to the notion of Lord Jesus come soon? If there is no actual consequence for the person saying it? But what if there is? What if John Darby and the Scofield Bible have it wrong? What if the evidence for a mid-tribulation or post tribulation rapture is stronger? I openly admit that I am not an expert on Eschatology but I have learned this much from operating a discernment ministry -- if most of the false teachers believe in the same teaching it is probably inaccurate. And do they ever line up for the pre-trib rapture beloved! That aside, I still find that as cruel as James and John were for wanting to call fire down from heaven. The notion that calling for the day of the Lord is ok because we might not have to suffer with the rest of humanity. Putting even that aside there still remains the question of our individual salvation because I find the majority of those clamoring for the imminent return of Christ may themselves not like it if He did. Beloved hear me very well. The Bible is very clear that we ought to test ourselves to see if we are truly in the faith. Paul teaches this because he knows how many were being deceived. That deception level has grown exponentially as time has worn on. There is a reason why heaven rejoices when only one sinner repents -- because few will. There is a reason why the way to eternal life is narrow and few are those who find it. The mega church mentality brags about salvations by the thousands that simply rarely occurs. It cannot occur without the whole Gospel being preached. Consider your average Sunday sermon by Joel Osteen with 55,000 in attendance and countless thousands watching on television. Joel will speak for about 30 minutes. He will have ten anecdotes and maybe three scripture references. Rarely will he actually read out a text. This is something he admits to and says that theology is not his gifting. Then at the end, after barely mentioning Jesus and never discussing sin or repentance, he asks people to say a three sentence prayer. It does not matter that the name of Jesus is in that prayer. It does not matter that he may have the people repeat that He will be their Lord. The prayer itself is powerless because the Gospel was never presented. Yet how many people will think they are saved because Joel then declares that they are? How many will go on to serve in ministries for decades believing that moment was their salvation? They may go on to other churches and still cling to this false salvation that cost them nothing and required no change in their life. They will learn the hallelujah hop and when to lie prostrate before a Lord they do not serve. They will fast for no real reason. They will join the chorus of amens when people cry out for the day of the Lord. Then that day will come and they will say Lord Lord only to discover that He never knew them. Test ourselves is what we are commanded. Work out our salvation with fear and trembling. But for the grace of God go I. This brings us to our key verses for today from the Prophet Amos. It seems Israel was having the same problem the church has today. Staggering arrogance and a seemingly blind understanding of where they were in relation to God. It seems they too were arrogantly calling out for the day of the Lord. Amos rebukes them harshly. Woe to you who desire the day of the Lord! That is an actual pronouncement of judgment upon them as it was when Jesus pronounced the woes over the Pharisees. Be careful what you wish for! For what you think you want so badly. Consider first what it is that you are seeking. Why would you have the day of the Lord? It is not light beloved but darkness. The first comparison God makes for us is a man who flees a lion only to run into a bear. This means there is no escaping it. There is no running away from it. There is no place to hide and no place safe. Time is up when the Lord returns. There are no more do-overs. No more mulligans. No more oopsies. Here on earth we can make excuses after excuses. We always think we have tomorrow but there is no more tomorrow when the day of the Lord is today! The second example God gives us is that the day of the Lord is like a man who went into a house, leaned his hand against the wall only to have a serpent bite him. There is no more sanctuary. There are no more safe havens beloved. The end is the end. It can be as venomous and deadly as we can imagine and there is no escaping it. The day of the Lord is darkness beloved; with no brightness at all.